Today’s temperatures were the same freezing temperatures we have had for the last couple of days. However, the sun was shining! It was too cold to be outside, but it was warm and cozy inside my studio. I have a large window in front of my long arm and this morning, I opened the blind and let the sun shine in! It was so sunny, you could see the reflection of the quilt that I was working on in the window. This is the quilt that I worked on today–not my quilt, it belongs to a customer. The last time I stopped to buy thread from my supplier, she showed me a new product from Superior Threads called Lava. 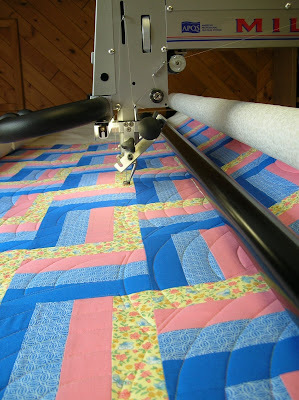 I bought a spool to try and this quilt was the perfect quilt to try it on. 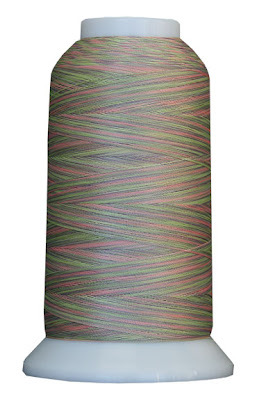 This thread colour is Soft Breeze. I leave you with two parting shots of my handsome, faithful companion, Joey. This entry was posted in baptist fan, customer quilt, joey, weather by Norma Hanson. Bookmark the permalink. You need to come to Toronto, we’re having great weather (just had to rub that in, considering B.C. gets a very early spring). Re Joey, you’re right, he is handsome, and he looks so young. Probably a year or two? Looks like the grass in greening up nicely in spite of your flexible weather–snowing again, for pete’s sake! Good pictures of Joey! You can see his little kitty face so much better the way the light is hitting. What a handsome fellow! 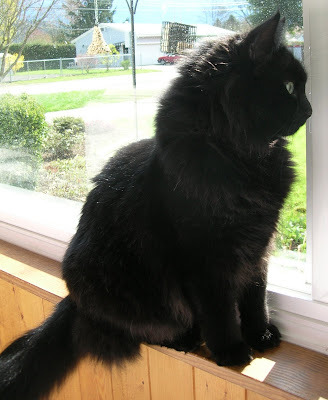 No doubt he is up watching the birds and looking for his kitty pal out there. I guess your weather moved here because it’s only 8 today and down to -4 tonight. Hopefully not for too long. The quilt is so bright and cheery. 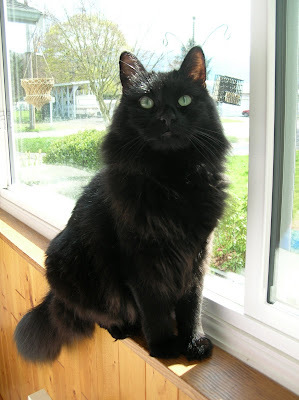 Your companion looks like he barely fits on the window ledge. He must really want that warmth from the sun. I can’t believe all this strange weather we are having. We actually had snow on the ground on Saturday – enough that the golf course didn’t open on Sunday, much to my DH’s displeasure. And it is really COLD. So odd for the last half of April! What a handsome gut, Joey is! My Daisy Dog rarely comes into the sewing room anymore…she prefers the upstairs with the sun Love the baptist fans you are quilting. 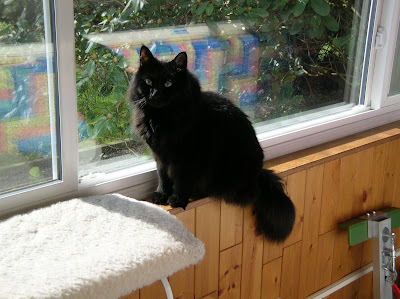 Joey looks so fuzzy and huggable… And I think it’s funny to balance on the little windowsill when there’s a big, cushiony, sunny cat perch not two steps or one leap away. Doesn’t he like it?